This entry was posted in news on July 31, 2010 by James Day. LATROBE — The big guys have a thing for the little cars. Last year, outside linebacker James Harrison arrived at Saint Vincent College in Latrobe for training camp driving a white SmartCar and took coach Mike Tomlin for a ride. This year, quarterback Ben Roethlisberger and his offensive line rolled up to the dorm in MINI Coopers. 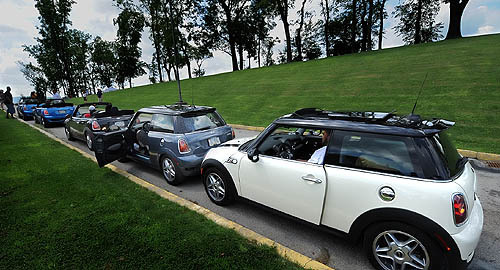 Read the article Several Steelers arrive in fleet of MINI Coopers. This entry was posted in brochures collectibles on July 31, 2010 by James Day. We finish July with the very first brochure that MINI USA produced. THE BOOK OF MOTORING was released in 2002. It was a full-color, squared-back booklet with 68 pages discussing “WHAT IS MOTORING?”. The booklet contains a smaller brochure inside titled “THE GOODS”. The MINI USA catalog number is BRO 01-02.